We offer one of the largest standard color selections in the industry; additionally, we also give you the option of choosing custom colors based on the Pantone Color System™. On selecting inverted screen printed and dual layer bands you can have swirl or segmented style ink on your messages. Our message styles include debossed, ink filled debossed, embossed, colorized embossed and screen printed. Messages with debossed and embossed style will be the same color as the band whereas the remaining message styles offer a different ink color to be used on the messages. Screen Print, as the name implies, is the normal print. Rather than glow-in-the-dark and glitter, we have a special glow for white bands which is the UV Glow. When your band goes under UV light, the color of the band changes to purple. Exciting, isn’t it? 100% silicone which is non-allergenic and latex free. 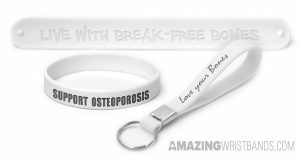 Our wristbands come in a variety of sizes and widths, including thin bands, half-inch bands, wide bands, thicker one-inch bands, key rings, vape rings and adjustable bands. We also offer popular slap bands that “snap” to a person’s wrist comfortably. Our upcoming products include USB bands and keychains. For more details, please contact us at 1-800-269-0910 or e-mail us at customercare@amazingwristbands.com. We are happy to have your order placed with us. You can also submit a quote for your white bracelets using our quote page.